Everyone has that one friend who loves the black jelly bean at Easter time - this is the sweet basket for them. Packed with British licorice flavored favorites, they'll enjoy Black Jacks, Hard Licorice Sticks, Licorice Comfits, Pontefract Cakes, Sherbet Fountains, and a darkly delicious collection of licorice candies that's sure to sweeten their day. 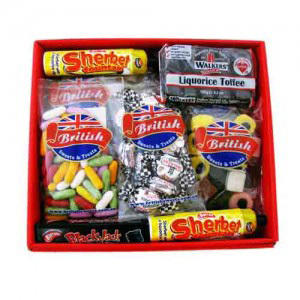 Ideal for birthdays, to send to their college dorm, or even as a Trick-or-Treat Halloween surprise from far away, send British Licorice Special today.